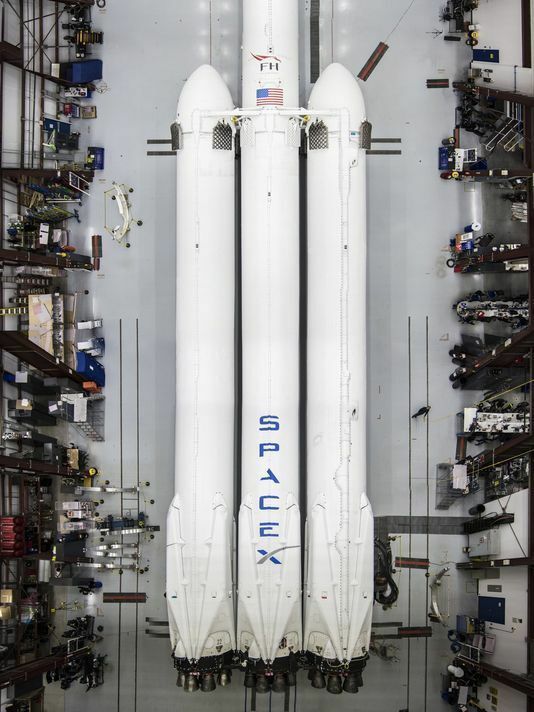 SpaceX's Falcon Heavy rocket is seen here at a Kennedy Space Center hangar. The three-core, 27-engine rocket is slated to launch from KSC in early 2018. 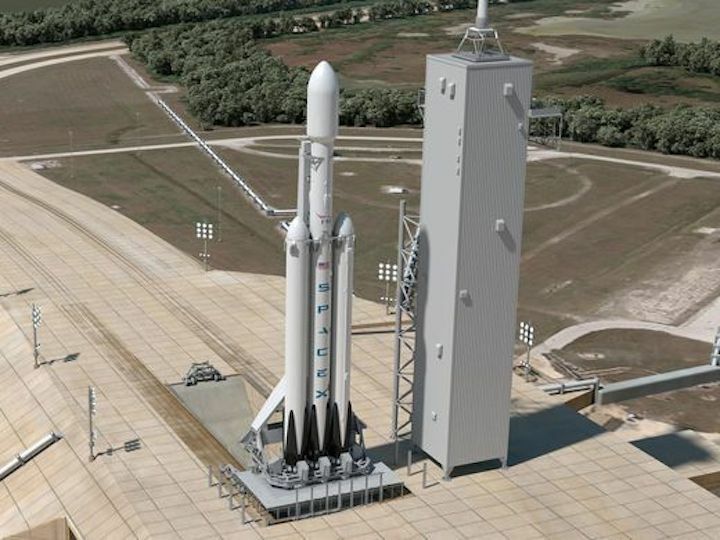 SpaceX's three-core, 27-engine Falcon Heavy flagship rocket appears to be nearing full assembly at Kennedy Space Center, according to new photos released by CEO Elon Musk. Photos posted by the billionaire entrepreneur on Wednesday show the 40-foot-wide rocket in a hangar near KSC's pad 39A, the legendary launching point for Apollo and space shuttle missions, but more recently single-core Falcon 9 launches. 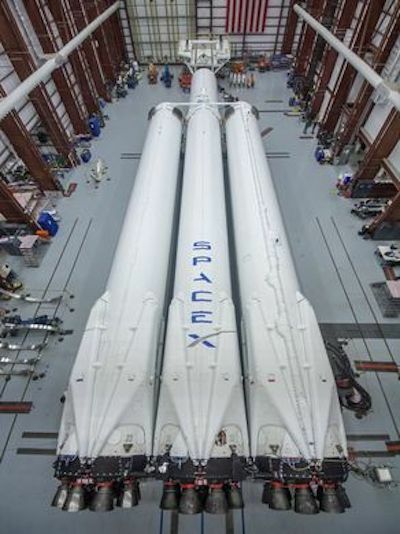 While all three cores appeared to be strapped together in the photos, the payload fairing that will eventually encapsulate Musk's midnight cherry red 2008 Tesla Roadsterhad not yet been installed. 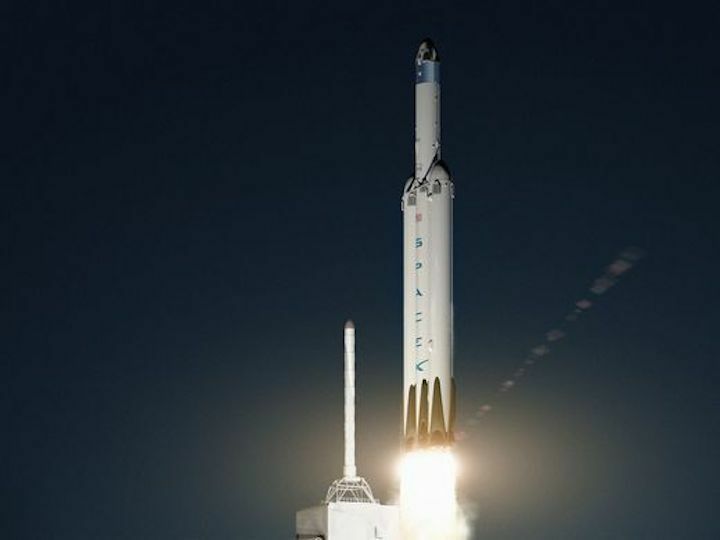 The 230-foot-tall rocket's premiere launch, which is more than four years behind when SpaceX first said it would fly, is targeted for sometime in January – likely a few weeks after it's transported to the pad and test fired before the end of December. 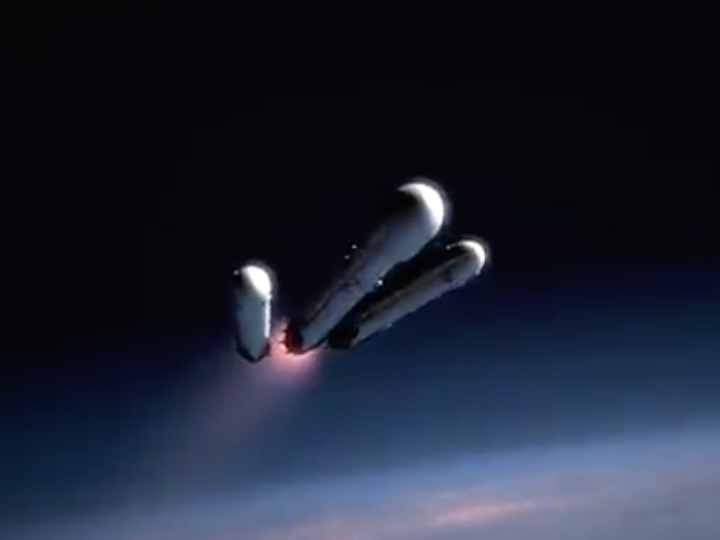 When the 27 SpaceX-built Merlin engines ignite for its maiden voyage, Falcon Heavy will become the world's most powerful rocket thanks to its more than 5 million pounds of thrust that can deliver 140,000 pounds to low Earth orbit. After liftoff, the two side cores will separate, leaving the center core to burn slightly longer to deliver the payload to the intended orbit. 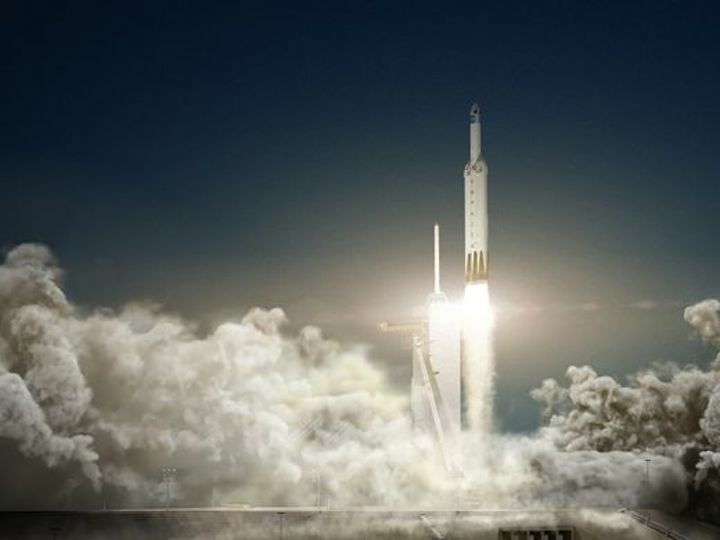 But three cores means twice as much fun for the Space Coast – while the region would typically enjoy the sight and sonic boom of a single descending Falcon 9 first stage, the Falcon Heavy demonstration flight will feature two side core landings at Cape Canaveral Air Force Station's Landing Zone 1. The center core, meanwhile, will target a landing on the company's Of Course I Still Love You drone ship. 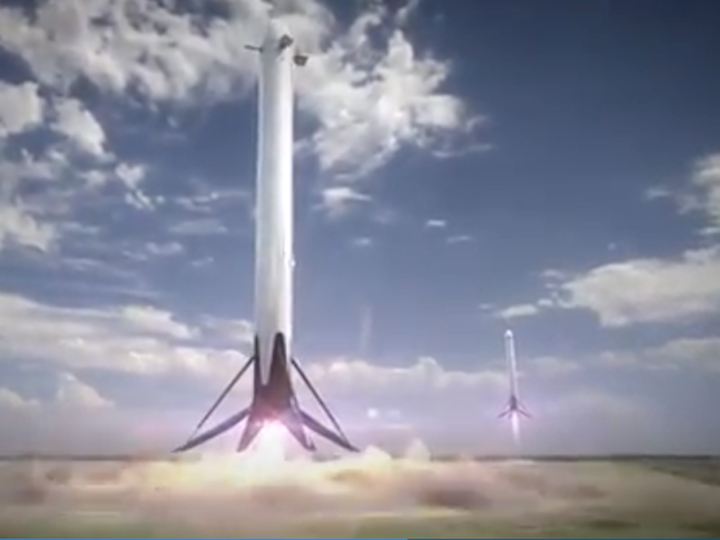 While Falcon Heavy simply looks like three Falcon 9 stages strapped together to deliver more power, the technical reality is much more complex, according to Musk. In March, he said during a news conference at KSC that developing the vehicle was a challenge beyond what he and his engineers had anticipated. The center core is excepted to bear the brunt of never-before-seen stresses due to the two side cores' powerful thrusts, forcing teams to constantly modify hardware and meet new demands.